The Tabata family is well-versed in the martial art of aikido. 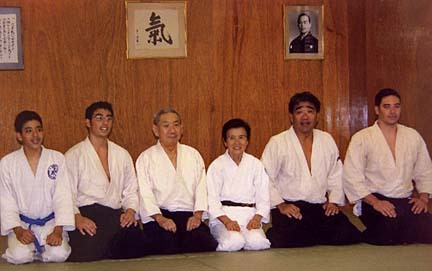 Grandson David Tabata, grandson James Tabata, father and mother Seichi and Emiko, son Calvin Tabata and grandson Michael Tabata all practice the discipline. When current and former students of Seichi Tabata gathered last July to celebrate the 50th anniversary of aikido in Hawaii, they also came to honor their longtime sensei. The 78-year-old semi-retired life insurance salesman and head instructor of the Seishin Kan Dojo in Nuuanu has been one of the most influential aikido teachers in Hawaii. He also was among the first group of students to study the martial art outside Japan when it was first introduced here in 1953. "Tabata did a lot for aikido in Hawaii," said local attorney Colbert Matsumoto, who trained under Tabata back in the early 1970s and went on to study the martial art on Maui under a different teacher. "He developed a number of very important instructors." Those instructors include several members of his own family. Tabata's wife, Emiko Tabata, is a sixth-degree black belt and his son Calvin Tabata is an eighth-degree black belt and is a chief instructor for more than 500 students at the Pacific Northwest Ki Federation in Portland, Ore.
Several of his grandchildren also hold black belts. Tabata credits the self-discipline from aikido training for much of his family's prowess in the business and academic worlds. Tabata, who operated the Household DeVille retail chain back in the 1970s, is a successful life insurance broker with Transamerica Occidental Life Insurance Co.
His son Calvin is a senior vice president and regional manager with First Hawaiian Bank's sister company, Bank of the West, and his daughter Betty is a certified public accountant. Calvin Tabata said the training also has helped his children excel at school and in other sports. His son Michael Tabata was a defensive end for the University of San Diego's football team while his other son, James Tabata, is completing his first year at the Air Force Academy in Colorado. "It's been a wonderful way to bridge different generations" said Calvin Tabata. "When you teach something like this, there isn't a generation gap." A native of Lahaina, the elder Tabata first came into contact with aikido back in 1953 when legendary master Koichi Tohei introduced the martial art to local and U.S. mainland audiences. And in the five decades since then, Tabata has introduced hundreds of students not just to the physical aspects of aikido but to the mental and spiritual sides as well. "My philosophy is very straightforward: I want people to be strong and have a healthy mind and healthy body and for them to be good to other people," he said. "If you do your best, you will have no regrets in life."